Ribbons, bows, sequins, decor. All words that make a groom-to-be cringe. While he is ecstatic to marry the woman of his dreams, many grooms would prefer an intimate day, or just a big celebration and forget about the flowers, the linens, and the neatly folded napkins. Through the months of linen options - napkins, runners, overlays - it is no wonder he is just ready to get this party started! Generally, the wedding is more about the bride than the groom. Well, bad choice of wording there. The elegance and the details are generally more centered around the bride, because she is generally the one who cares about all of that. 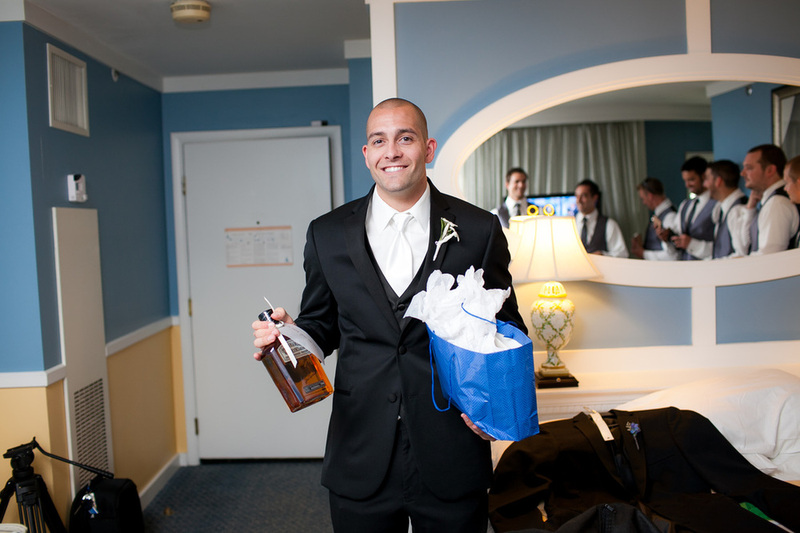 Not saying that all grooms don't care - my hubby was very involved in all of the planning. But at some point, it gets to be too much in his eyes and he is ready for the planning to be over. So after months and months of appointments, decisions, and details, why not plan a special surprise just for him, a thank you for putting up with all of that, a thank you for sticking by your side to make sure the big day is exactly as you have dreamed. Today, I've put together some great groom surprise ideas for the wedding day so you can add a little personal touch that he will love, a touch that will make him feel very special. Because who doesn't love surprises?! Surprise him with that watch he has been looking at for months. To make it even better, he can wear his new gift for the wedding day! Or if there is not much money left in the budget, create a fun gift that he can use which will be much less expensive! "Just in case your feet get chilly"
One idea that I totally would have done if we had some more room left in our budget would've been a surprise groom's cake! To be honest, he didn't care even the slightest bit about what our cake looked like. Cakes are a little girly to begin with...the guy's just like the tastings. Am I right or am I right? So after you cut the "real" wedding cake, surprise him by bringing out a cake make specially for him! If I were to choose, I would've done one that combined football and Coors! But whatever you choose, pick something that screams him, something that will make him feel happy and very special! One area where a groom is generally ecstatic to be involved is the music. How about taking it a step further and surprising him with his favorite band or DJ to play for part of the reception?? That sure will make him smile a little bigger! I saved one of my favorites for last and this is one that I did on my wedding day too! Before it is time to get into your dress, have your photographer or even a bridesmaid snap a couple of boudoir shots to text him right before the ceremony! But of course, don't show your face or it will be bad luck! And I would show you mine, but those are for the hubby's eyes only!No matter what you choose to surprise your groom with, make it personal. Choose something that you know he would absolutely love without a doubt, something that will make him smile a little bigger. While the wedding plans may be all about you, make this special gift all about him!